Gettysburg is an area that is rich in history with many points of interest including the Gettysburg Battlefield, Gettysburg National Military Park, and Gettysburg Cemetery among many others. Staying at the Brickhouse Inn puts you in the heart of must-see area attractions for history buffs. The first point of call for any first-time visitor to Gettysburg should be the Visitor Center, located on the Baltimore Pike, about a 5-minute drive, or a 20-minute walk, from the Brickhouse Here you will see a fine museum (opened in 2008), the Cyclorama, and a twenty-minute movie. The movie gives you the background to the Battle of Gettysburg in the context of the Civil War. After watching the movie, you are taken into the Cyclorama, a magnificent 360-degree painting that dates from 1883 and has recently been restored. On a viewing platform, you hear a commentary on the Battle with a light and sound show. You can then move into the museum, which contains galleries with videos depicting the Battle and artifacts collected in the aftermath. You will need at least an hour and half to see these three attractions, and longer if you wish to spend more time in the museum. After the Visitor Center, you will want to see the Battlefield (National Military Park). It surrounds the town of Gettysburg and is about 6,000 acres in extent. The best way to see the Battlefield is with a licensed guide. The guides are licensed by the National Park Service to take visitors around the Park. The standard tour lasts two hours and the guide drives you in your car. The standard guide’s fee is $63 (for up to 6 people) and a gratuity is expected; also, there is a $12 booking fee. The guide will take visitors for a tour lasting more than two-hours, by arrangement. We highly recommend a three-hour tour for $94.50. The Shriver House Museum is about a 5-minute walk from the Brickhouse Inn, on Baltimore Street. It is a Civil War-Era House that has been restored with authentic furnishings. A guide takes you on a thirty-minute tour of the house, describing the history of the family who lived there, and their experience during the Civil War. The visitor thus gets a different perspective – by hearing about the effects of the Battle on civilians. The David Wills House is on Lincoln Square, about an eight-minute walk from the Brickhouse Inn and is owned by the National Park Service. David Wills was a lawyer in Gettysburg at the time of the Battle. 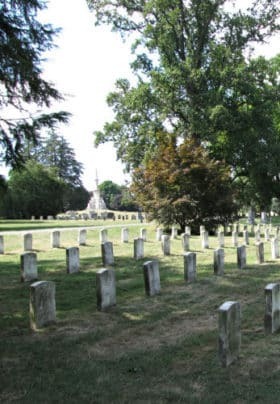 In the aftermath, he was asked by the Governor of Pennsylvania to choose a site for a cemetery where the soldiers who had been killed in the Battle could be buried. He chose the site, which is now the National Military Cemetery (see below). 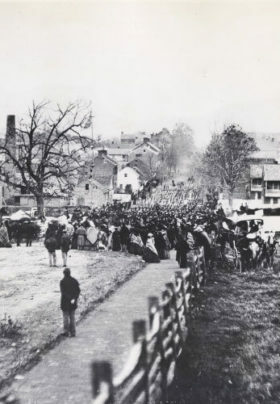 When the time came to dedicate the cemetery on November 19, 1863, David Wills invited President Lincoln to be one of the speakers and to spend the night at his house. Lincoln is reputed to have put the finishing touches to the famous Gettysburg Address in the Wills House that night, and you can see the bed that he slept in. The National Military Cemetery, the Soldiers Cemetery is a three-minute walk from the Brickhouse Inn. It is open to visitors during daylight hours. Among the many monuments is one commemorating President Lincoln’s famous Gettysburg Address. There are two or three free tours every day, lasting 45 minutes, in April through November. The Eisenhower Farm can be reached by shuttle bus from the Visitor Center. The former President’s house and farm belong to the National Park Service, and a Park Ranger will show you around the house where Dwight Eisenhower and his wife Mamie lived in retirement.